You only have to pay sales tax if you are located in the same state as our warehouse. However, there is no sales tax on eyeglasses/optical goods. Tax is added for non-prescription eyewear. Click the "My Account / Order Status" link at the top right hand side of our site to review your orders. You may compare your order history on our website, with your financial records. If you have further questions or concerns, please contact customer service for further assistance. 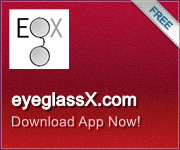 Email: info@eyeglassx.com or Telephone us. Your credit card will usually be charged within 24 hours prior to shipment of your item(s). If you have ordered new replacement lenses for your frames. Your charge will be applied once we receive your frames and get them into our lab.